The AE86 has gained so much fame due to the anime Initial D that unmolested examples fetch a premium asking price on the market. 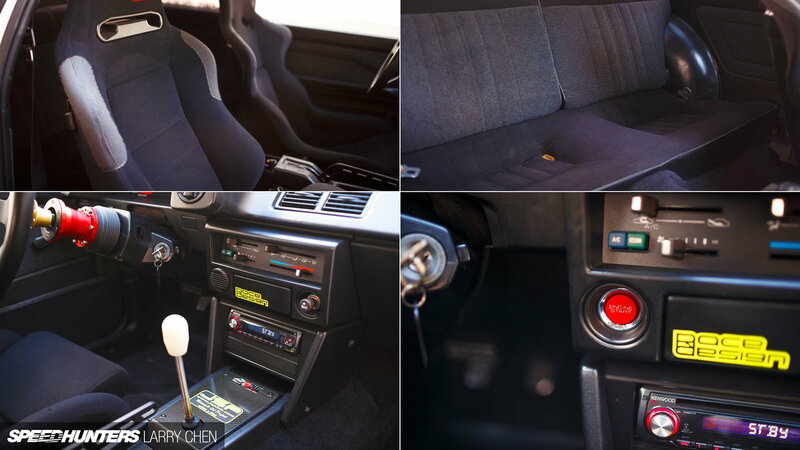 Check out what one owner did with his to put some Honda oomph into his Toyota. As I mentioned in the teaser for this article that many can count their first moment of becoming aware of this great lightweight car thanks to Initial D but the owner Mickey Andrade found it another way. Mickey has been a part of the stateside drift scene since the early days of its inception and witnessed folks like Tako Aono and Darren McNamara among others driving the Corolla. 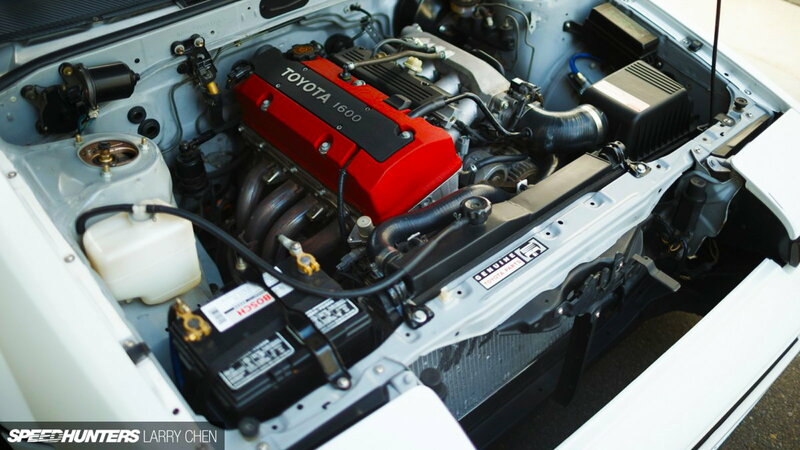 >>Join the conversation about this AE86 with the F20 right here in S2Ki.com. The excuse to buy another vehicle finally presented itself in 2011 when Mickey was rear-ended in an accident and needed a new set of wheels while the truck was being repaired. Well, anyone would first think of something normal and cheap to buy as their interim vehicle but not this guy, he bought a Corolla SR5. I know what you're thinking, why not the GT-S? When I throw out the fact that Mickey got the SR5 for $800 bucks even may make things a little clearer on how he came to that purchasing decision. As all of us enthusiasts in the car world knows, when the mod bug bites, it usually bites hard as hell. So the recent purchase Mickey made to just be a sedate daily driver fell by the wayside as he delved deeper and deeper into the dark world of AE86 performance upgrades. Following in the footsteps of other SR5 owners before him he went and began transforming the car into a GT-S model. Mickey did things the right way for this endeavor and enlisted the help of his friend Taka Aono to make sure the conversion went along smoothly. With that being said in went a twin cam 4A-GE engine swap, sways along with braces, an upgraded fuel tank, and every part that would be stock on a GT-S. Pro tip for anyone thinking of doing a conversion on their car that their friends already have is that they'll have spare parts laying around that you can get for either a deep discount or free. While Mickey initially enjoyed the new to him GT-S he still felt that the car was missing something while out on track days having to deal with corners. That 1600cc powerplant just wasn't enough to muster any fun when taking the fight to bigger bullies out on the twisties. 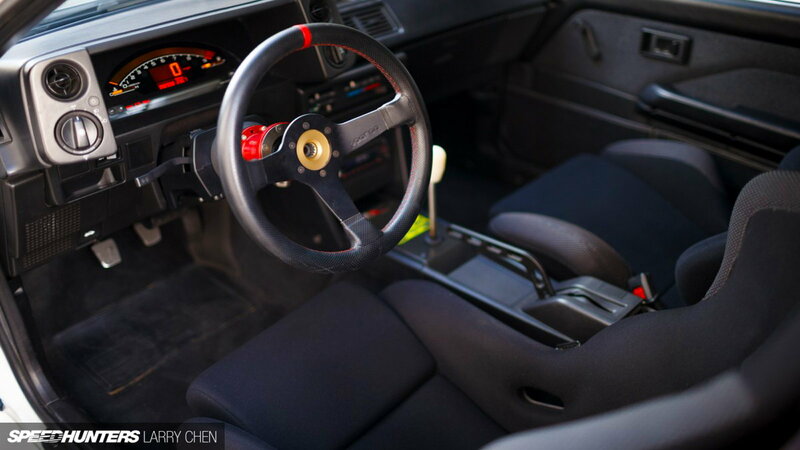 The saying of out with the old and in with the new came to pass as Mickey knew he needed an upgrade and an F20C motor swap was just the ticket for the AE86 chassis. Another friend John Russakoff had tipped Mickey off to the engine as a surefire way to not only gain more power but doing so without the downside of sacrificing reliability. As luck would have it Mickey was searching for a donor chassis for a drift build and came across a salvaged S2000. The duo purchased the car with Mickey claiming the engine, transmission, and wiring while John took the shell. 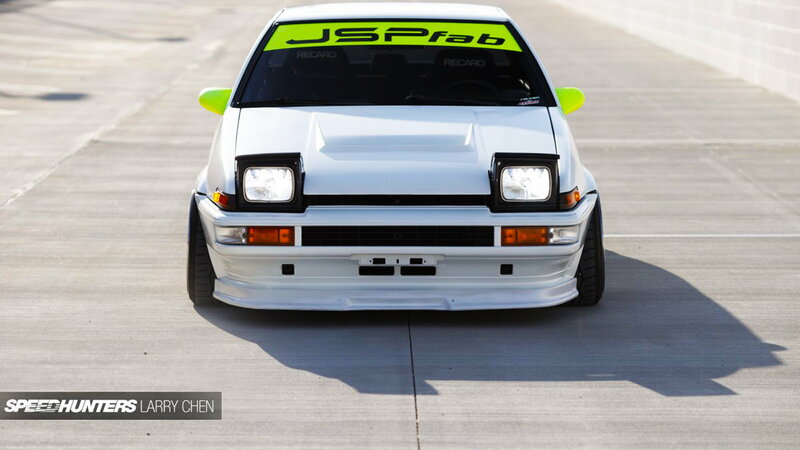 The AE86 then took a trip down to John's shop JSP Fab in San Diego and the conversion began. While the choice of changing the engine cover on the F20 to a Toyota 1600 one is questionable to us, we love everything on the car. The car received more upgrades such as adjustable coilovers for the front and rear, JSP Fab lower control arms and other upgrades thanks to T3. Stopping power for the car was upgraded thanks to Project Mu parts at all four corners and a beefed up ASD emergency brake was thrown in so that the Corolla could get sideways whenever needed. The interior of the car was sourced from a perfect mint condition GT-S from Canada and was shipped down to California on a pallet. Add to that was a pair of Recaro seats and a Sparco Champion steering wheel and things were looking quite nice in the cabin. The exterior of the Corolla has evolved and changed over the years and now is a tasteful mix of JDM parts and aftermarket pieces to make a uniquely gorgeous car. The front and back bumpers are De-textured JDM and the sideskirts are Shine Auto. The rear diffuser out back comes from MCNSport. The widened fenders sticking out just as much as the lip of the 16 inch HRE wheels are D-Max to give the 86 an aggressive yet subtle look. To finish things up the car was treated to a few healthy coats of Lexus Starfire White Pearl and a layer of clear coat by Creations 'n Chrome. After all of that work, Mickey enjoyed driving the Corolla a great deal until a few other projects took precedent and he sold the 86. The situation had just become that the car wasn't getting the love and attention it deserved and so he let it go so that someone who could really enjoy the car every day had the opportunity to do so. Although he does say that he won't rule out buying another 86 in the future and even told the new owner of the Corolla that should he ever want to sell it that he be the first to know.